Fairfax Stone Historical Monument State Park is a West Virginia state park commemorating the Fairfax Stone, a surveyor's marker and boundary stone at the source of the North Branch Potomac River in West Virginia. The original stone was placed in 1746 to settle a boundary dispute between Thomas Fairfax, 6th Lord Fairfax of Cameron and the English Privy Council concerning the Northern Neck of the Virginia. It determined the proprietorship and boundaries of a large tract of mostly unsurveyed land in the English colonies of Maryland and Virginia. The exact boundaries of the "Northern Neck land grant" (later called the "Fairfax Grant") had been undetermined since it was first contrived in 1649 by the then exiled King Charles II. John Savage and his survey party had located the site of the source of the North Branch Potomac River (the northern boundary of the tract) in 1736, but had made no attempt to establish the western boundaries. A 1746 survey by Colonel Peter Jefferson and Thomas Lewis resulted in both the placement of the Fairfax Stone as well as the establishment of a line of demarcation known as the "Fairfax Line", extending from the Stone to the south-east and ending at the source of the Rappahannock River, a distance of 77 miles (124 km). Because of bends in the North Branch Potomac River, the Stone is only a county corner of West Virginia counties rather than part of the border with Maryland. This issue was only resolved when the Supreme Court ruled against Maryland in determining that Maryland would only go up the Potomac far enough to meet a point where a North line from the Fairfax Stone would cross the branch of the Potomac. Without the ruling, the boundary of Maryland was indeterminate. West Virginia counties—Tucker County and Preston County— share the boundary marked by the Fairfax Stone (West Virginia having seceded from Virginia during the American Civil War). 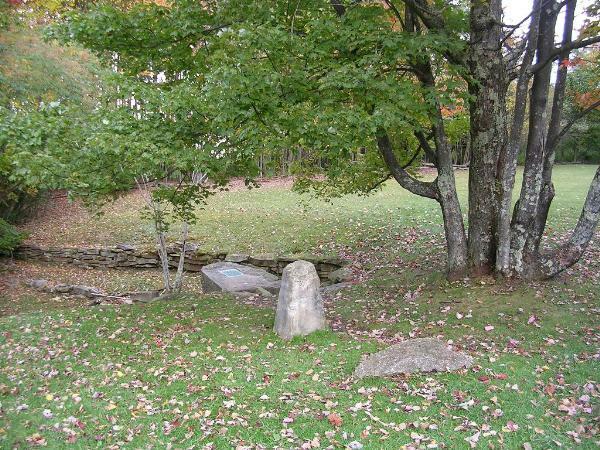 The original Fairfax Stone, in accordance with common surveying practices of the era, was most likely simply a natural, unmarked rock selected from among the outcroppings in the area. Legal boundary disputes between Maryland and Virginia caused the latter to relocate the stone in 1833 after the site had been lost to memory. The stone was still intact in 1859 when one Lieutenant Melcher found it again and ran the "Fairfax Line" on behalf of the two States. The Stone was gone by 1909, however, having been carried away by vandals. The present Fairfax Stone is a replica.